FEYNLAB is a world leader in nanotechnology development and manufacturing for automotive, marine, and aerospace applications. Detail Your Eyecandy are your FEYNLAB Authorised Detailer. This allows us to offer the full range of FEYNLAB products to our customers which includes the exclusive professional range of self-healing nano coatings. These consist of FEYNLAB Ceramic Plus, FEYNLAB Heal Lite and FEYNLAB Heal Plus. Each coating has a manufacturers guarantee and this ranges from 2-7 years depending on the coating applied. 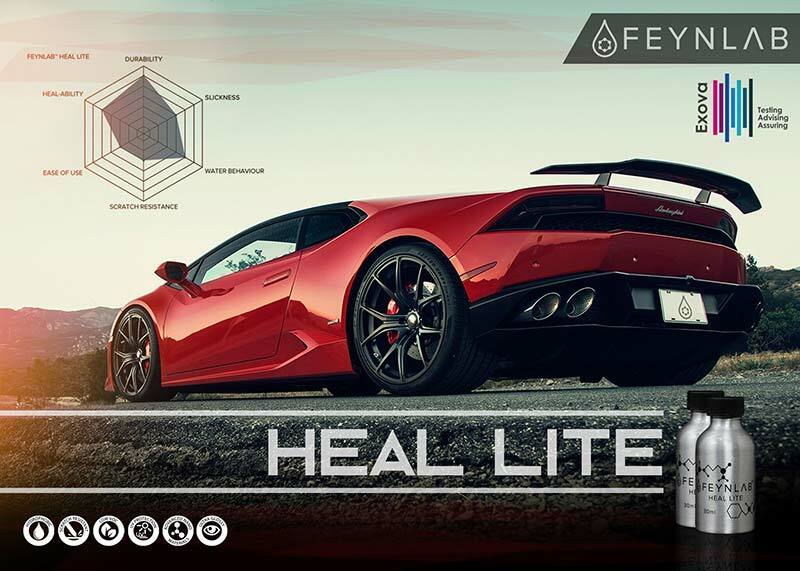 FEYNLAB Heal Lite and FEYNLAB Heal Plus offer the self healing performance as paint protection film but at a lower cost. 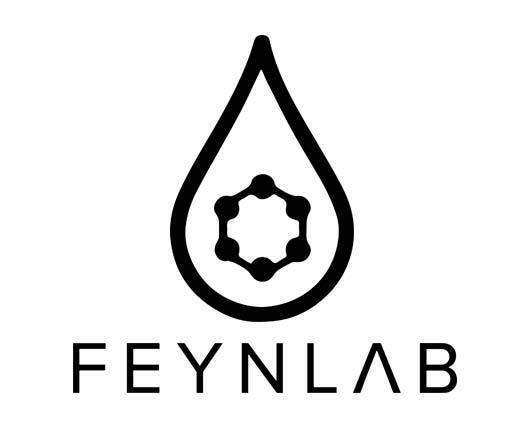 FEYNLAB hand applied Self Healing Technology is based on their ceramic nano coating formulation. The backbone contains ceramic polymer chains, infused with their smart nano particles. Imagine nano sized magnets attached to the end of the durable ceramic chains, creating a memory-polymer. The memory polymer recovers to its original (cured) state when heated. 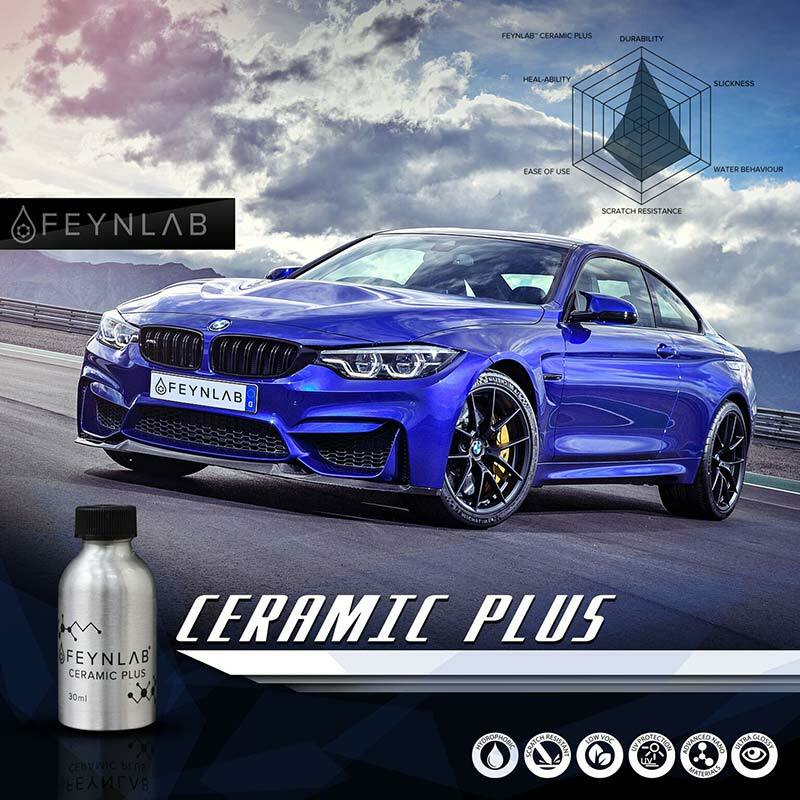 FEYNLAB CERAMIC PLUS combines ultra durable ceramic technology, with self healing technology, giving it approximately 40% of the self healing properties of FEYNLAB HEAL PLUS. The ceramic portion of this product has been modified to maintain a high level of flexibility by using shorter chain ceramic co-polymers, this allows the self healing portion to function, but to a lesser extent than that of FEYNLAB HEAL PLUS. FEYNLAB CERAMIC PLUS also incorporates smart nano-particles that increase the perceived hardness. The nano-particles operate as a dry lubricant, deflecting and reducing scratch or mar intensity. If micro marring and light swirl marks do occur, the coating will recover by up to 40%, making these marks less significant and almost invisible on lighter colored paints. FEYNLAB HEAL LITE offers approximately 60% of the self-healing properties of FEYNLAB HEAL PLUS. HEAL LITE is ultra durable, extremely hydrophobic and has excellent UV protection. This product was developed with darker colored vehicles in mind, where swirl marks and ‘spider web’ scratches are more visible. These swirl marks and fine blemishes are inevitable, no matter how careful you may be with washing. FEYNLAB HEAL LITE is the answer to this problem and is designed to stop them. The heat from the sun or warm water will cause the ceramic polymer matrix to re-set allowing these imperfections to heal. FEYNLAB HEAL PLUS is the flagship product of the brand and is a state of art self healing nano coating offering full self healing . FEYNLAB HEAL PLUS will heal itself instantly if heated above 60 degrees celsius, removing all fine scratches, swirl marks and wash marring. At room temperature these imperfections will heal over a number of days. It is also worth noting that use of a hairdryer, warm water or parking your vehicle in the sun will accelerate the healing process. The FEYNLAB HEAL PLUS is ultra glossy, and improves the depth of shine dramatically. It is by far the thickest coating currently offered on the market, measuring up to 15 microns. The mechanism behind the healing effect involves using nano scale magnets on the end of the ceramic chains, that when heated vibrate at very high frequency causing the ultimate self levelling effect to occur. It does not turn into a liquid when it heals, but rather a type of superfluid (solid with fluidic properties). Please get in touch to find out more.